2016 Ford F-450 Super Duty For Sale In Vernon, Kelowna, Okanagan, BC. For tough jobs there is a tough truck, willing to go the distance and provide boundless capability. The 2016 Ford F-450 Super Duty combines practical reliability with touches of sophisticated luxury for a vehicle that goes beyond expectations. Allow the connectivity options of the interior to keep you in the know as the exterior provides strength and ability for the powerful performance potential. You are given a choice between the F-450 XL, F-450 XLT, F-450 Lariat, F-450 King Ranch, and the F-450 Platinum. 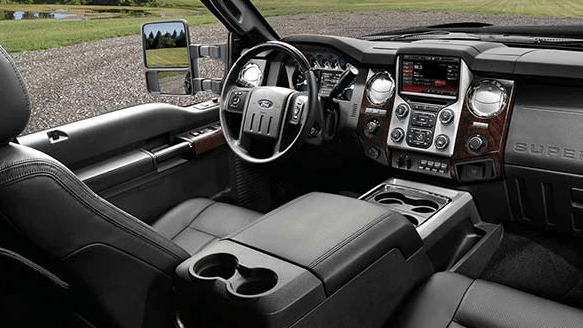 Bold interior designs come through on the 2016 Ford F-450 Super Duty Crew Cab as you experience what it means to drive a fully capable truck and enjoy every minute of it. A smooth and ergonomic interior design is offered to you with many customizable options, giving you the power to select what is best for you. Choose from a variety of seating options, including heavy duty cloth bench or bucket seats, premium leather trimmed 40/20/40 seats, or the unique Platinum heating and cooling front leather seating surfaces. Your environment becomes your own as you control your settings to suit your exact needs through features such as the available dual-zone electronic automatic temperature control. Simultaneously set two differing front temperatures for a customizable climate that keeps everyone satisfied. The steering wheel offers mounted audio controls to keep your hands in a position of focus while you adjust your settings. Stay connected through the SYNC, or SYNC with MyFord Touch systems. These systems offer Bluetooth capability for hands-free communication, as well as access to your compatible devices. You are also give access to the available SiriusXM satellite radio system with over 120 commercial-free channels for a variety of entertainment options. Ensure that you remain informed of important vehicle information on the go through the available 4.2-inch instrument cluster and LCD productivity screen because an informed driver is a safe one. All-weather floor mats are available to keep the interior of your cabin clean and dry through deep grooves and raised ridges, which work to hold mud, slush and snow. 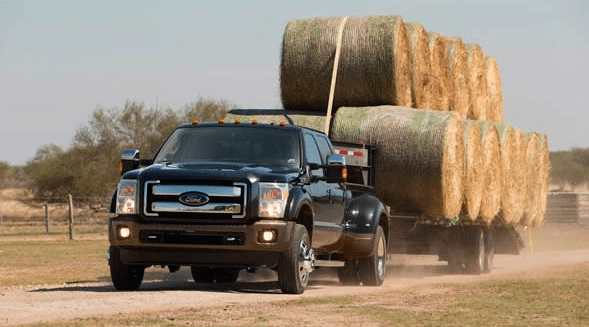 Big durability comes through on the exterior of the 2016 Ford F-450 Super Duty Crew Cab as bold features offer an aggressive and tough appearance. Luxurious touches, such as the available chrome steel bumpers and chrome bar-style grille bring the level of sophistication up as this truck shows evidence of its capability. Brighten up the path through the available fog lamps and dual beam halogen headlamps, which offer widespread visibility in a variety of weather conditions. For added visibility, the optional PowerScope trailer tow mirrors with heated glass and a heated convex spotter mirror provide additional awareness of the space around the vehicle so that every move is an informed one. Access the 8’ box cargo area through the available tailgate step with a 350-b capacity. Drive the truck that means business as you endure a vast array of weather conditions and deliver performance with ease. 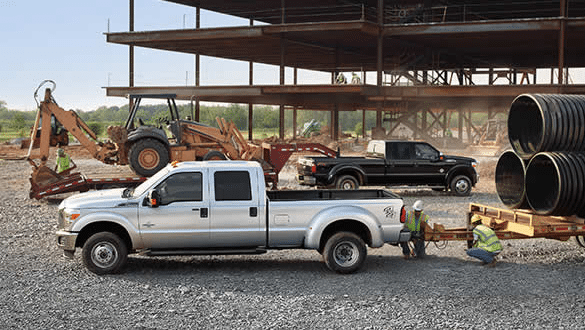 When properly equipped, the 2016 Ford F-450 Super Duty Crew Cab is able to deliver best-in-class maximum 31,200 lbs (14,1522 kg) of towing capability. Work without hesitation as this truck offers capability beyond expectations. The TorqShift Heavy-Duty 6-speed SelectShift automatic transmission provides big, strong gears that can handle extra torque and deliver high performance with strength and durability. This system is able to undergo high heated situations and allows you to rev it harder and drive with a greater range of possibilities. Enjoy the capability and style of the 2016 Ford F-450 Super Duty Crew Cab as it works to get the job done. 2016 Ford F-450 Super Duty For Sale In Vernon, B.C. Get through any situation and work hard with pride in the 2016 Ford F-450 Super Duty and the unbeatable performance if offers. The strong stance and enhanced exterior features provide a shield of durability from which you can travel on a variety of terrains and through many weather conditions. From the interior, you are able to work in a clean and warm environment, while the powerful engine gets the job done. Connect to the outside word as you experience the joys of your own personal haven in the truck that means business. Discover the 2016 Ford F-450 Super Duty and all it has to offer at your local Venon Ford Dealer - Watkin Motors Ford. Take it out for a test drive and select your favourite trim level and accessories. Make this Ford truck your own and drive it home today from Watkin Motors Ford.